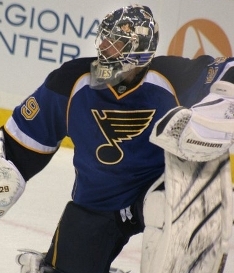 The St. Louis Blues wrapped up their 2010-11 season just a couple weeks ago, but already fans of the team are craving to see their favorites in action again. Thankfully, due to the International Ice Hockey Federation (IIHF) World Championships, several Blues will return to action and give somber fans something to root for. Ty Conklin, Chris Porter and Kevin Shattenkirk are all set to represent the United States when the tournament kicks off. Other members of the organization will take part in the World Championships held between April 29th and May 15th, but the group that is representing Team USA might be the most interesting to follow for those of us in St. Louis. The trio may all currently originate from the Blues, but each man has a very different path laid out in front of him following the completion of the tournament. Conklin struggled (to say the least) in 2010-11 and has likely played his last game with the St. Louis Blues, assuming the mystery that is the ownership situation doesn’t throw us any surprised. One would imagine that Conklin will move on to a new club since his contract is set to expire and the Blues have the luxury of an intriguing Ben Bishop waiting in Peoria. The goaltender was placed on waivers near the final stages of the year, only to find his name pass right through as no other team placed a claim on him. A safe bet says that Conklin will hope to use the World Championships in an attempt to show he can be a capable backup for a new team and that his struggles this past season are well behind him. Porter, an unrestricted free agent, finds himself in a very similar situation to the previously discussed Ty Conklin. The forward appeared in 45 games for the Blues last season, scoring three goals and four assists for a total of seven points. In a nutshell, Porter was very average and did little to make fans desire his return in 2011-12. While the organization remains in flux as it hunts for a new owner, it’s pretty difficult to predict which free agents will return and which will be told to hit the open market. In Porter’s case, it seems to be a 50/50 split whether we will see an offer sheet handed his way. Like Conklin, perhaps Porter is also using the World Championships in an attempt to showcase his efforts if the Blues ultimately decide to let him walk. 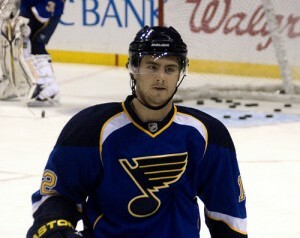 Finally, that brings us to Kevin Shattenkirk, the most exciting member of the organization set to play for Team USA. He hasn’t played in St. Louis long but it is clear he has already made a massive impact on the fan base. Shattenkirk likely sees the tournament as a chance to continue to develop his already impressive skills – a true testament to the determination and fire this youngster skates with. At just 22, Shattenkirk has already displayed poise and knowledge of the game well beyond his years and has quickly become a cornerstone of the St. Louis blueline. There’s plenty of doubt regarding several players on the St. Louis roster and their future with the team, but Shattenkirk is one defenseman that should feel confident that he will be with the organization for years to come.